Instrumentalist and composer, Yunie Mojica was born in Hartford, CT and raised in the town of Windsor, CT. Being both Puerto Rican and Dominican, she has grown up in a house hold where Salsa, Merengue, and Latin Jazz would be streaming through the house. Artists such as Tito Puente, Machito, and Hector LaVoe were a constant choice on her father’s play list. Yunie started her musical journey by playing the clarinet in elementary school performing in concert bands and summer programs with in the town of Windsor. Her first experiences with Jazz and the alto saxophone was during her sophomore year in the Windsor High School Jazz Ensemble, and at the Litchfield Jazz Festival Summer Music School, in Litchfield, CT. Yunie attended the camp for 3 consecutive years as a student, and 1 year as a residential assistant in the student dormitories. 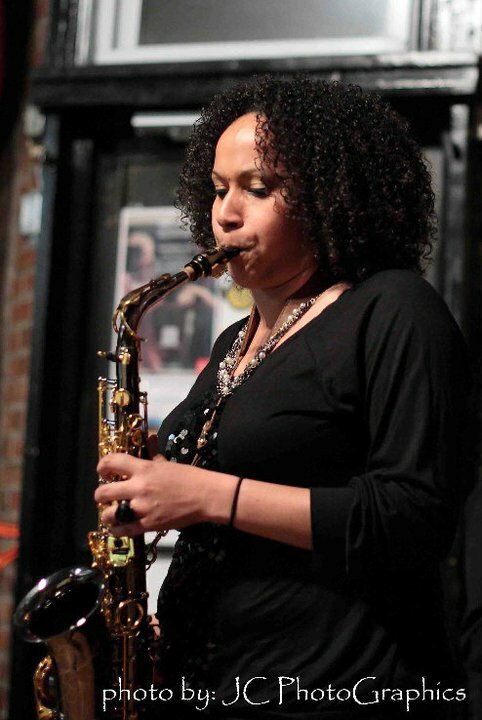 From 2005-2009, Yunie Mojica continued her studies at the Hartt School of Music and the Jackie McLean Institute of Jazz at the University of Hartford [Connecticut], where she received her B.A. in Music Management with Jazz Emphasis. During those years, she has had the experience of being both, a student and instructor for the Youth Jazz Orchestra at the Artist Collective in Hartford, CT, founded by Dollie and Jackie McLean. Throughout her college career Ms. Mojica has opened for jazz masters, including Curtis Fuller, Randy Weston, and Hank Jones. She has also performed alongside her mentors and professors of the Jackie McLean institute, Rene McLean, Nat Reeves and Steve Davis. Through Ms. Mojica’s college career and beyond, she has had the pleasure of studying with alto saxophonist Kris Allen, multi-reed instrumentalist Rene McLean, Jimmy Greene, and Abraham Burton. She has also interned for the not-for-profit New York based organization, Jazz at Lincoln Center, under the Programming & Concert Administration department. While there she was given the opportunity to travel to New Orleans, LA to produce and coordinate musical events featuring Elis Marsalis, Don Vappie, and many other musicians native to the New Orleans area. Yunie Mojica has also worked and performed with jazz masters such as Charli Persip and Valery Ponomarov.